MSU BILLINGS NEWS— Montana State University Billings will host its 2019 Internship and Career Fair on Wednesday, Feb. 13 from 1 to 4 p.m. in the Student Union Building on the University campus. This event is held each year in conjunction with Rocky Mountain College, and students are encouraged to attend and speak with prospective employers. Employers from 50 organizations, representing non-profit, for-profit, and government agencies will be on hand to speak with students and answer any questions about job opportunities in the area. These employers are looking to network with students and members of our Billings community to fill part-time, full-time, and internship positions. Attending organizations include Wipfli, KSVI/KHMT, Wells Fargo, Eide Bailly, Billings Clinic, Discount Tire, Stockman Bank, Tyler Technologies, RDO Equipment Co., Montana Army National Guard, St. Labre Indian Catholic School, Energy Laboratories, Inc., Zoot Enterprises Inc., and many more. This event is part of a larger series of events in March and April that includes résumé building, networking, etiquette, and interviewing workshops. This event is a great opportunity for soon-to-be-graduates and any students looking to prepare for the next steps in their careers. Learn about current or future openings, career-building internships, and emerging opportunities in the workforce from experienced employers and company representatives. 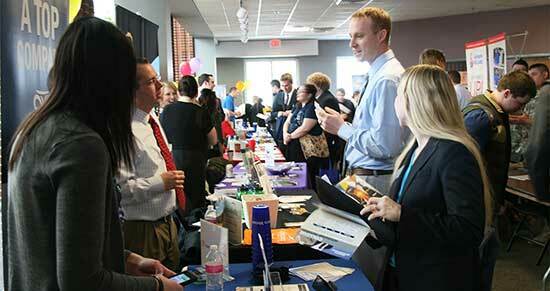 This is the first of two Career Fairs hosted through MSUB’s Advising & Career Services office. The MSUB City College Campus Career Fair will be on Thursday, February 21 from 10 a.m. to 1 p.m.
For more information, contact MSUB Advising and Career Services at (406) 657-2168 or advising@msubillings.edu.